Do you want to see the world? Now you can see it every day at the office or in school. 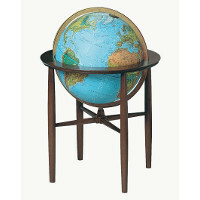 Floor Standing Globes and Tabletop Globes help you get a perspective on bigger pictures when you�re feeling stressed. Floor Globes of the world make it easy to bring the Earth to your eye level and ponder the Earth during moments of reflection at work. Social studies materials and geography teaching tools, like Dry-Erase Write-On Globes, Interactive Globes, and Inflatable Globes make it easy to explain Geography. Globes for schools make it easy to show students a new world and introduce them to what Earth looks like from space. Give students Beginner Telescopes to show them what Space looks like up close. The blue ocean globe and beginner�s globe make great otherworldly companions to any Early Childhood Classroom. Globes for desks at work give a sophisticated look to any office and bring the outside world into a small office. Try out a Moon Globe or a globe held up by Atlas, who literally is holding the world in his hands. 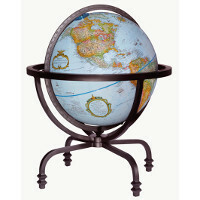 The Desktop Globes and tabletop globes both fit well on any desk, side table, or tabletop. Browse all of the Globe options and remind yourself that there is a whole world outside of that classroom or office.